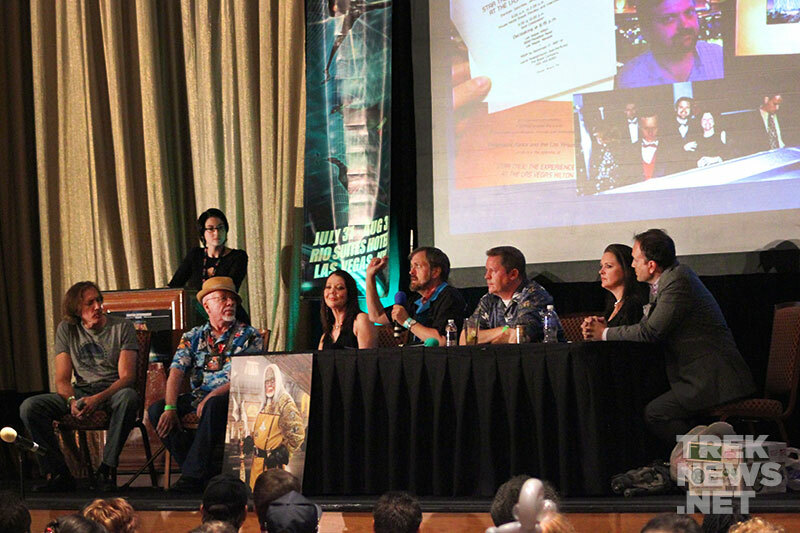 On Sunday, Creation’s Official Star Trek Convention in Las Vegas rolled on. The day’s events saw on-stage appearances by Kate Mulgrew and her son Alec Egan, Harlan Ellison, Walter Koenig, JG Hertzler and Robert O’Reilly appearing as Martok and Gowron, a look back at Star Trek: The Experience, and of course, Captain Kirk himself William Shatner. The fourth and final day of the 2014 convention kicked off with Kate Mulgrew introducing the audience to her son Alec Egan. Egan is an MFA graduate of Otis College of Art and Design. In honor of the 20th anniversary of Star Trek: Voyager, he created a painting of his mother as Captain Kathryn Janeway. Harlan Ellison was back for a third round of unfiltered opinions, as he interviewed TOS star Walter Koenig. For the second year in a row, JG Hertzler and Robert O’Reilly appeared on stage (and in character) as the Klingon warriors Martok and Gowron. The pair entertained the audience by singing Klingon songs, pulling fans in Klingon costumes on stage, and poking fun at each other. 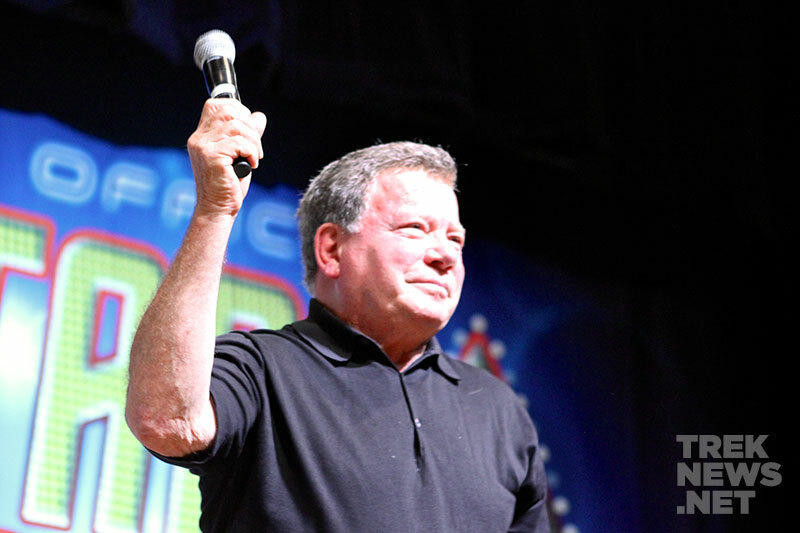 Next up, it was time for the Captain’s arrival as William Shatner took the stage. “I was laid up for a week and totally helpless,” he said. Shatner went on to discuss his next documentary, Wacky Doodle, focussing on the beginnings of Star Trek: The Next Generation. He showed a short clip to the audience. “They’re wonderful people,” he said of the TNG cast. He told the crowd that he just watched Star Trek V: The Final Frontier in his hotel room, last night. 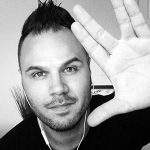 He said when he suggested the idea of “God” to be part of the film, Star Trek creator Gene Roddenberry asked him “Who’s God?” and “Which God?”. Shatner joked that he wished Leonard Nimoy had directed Star Trek V and he had sat in the director’s chair during Star Trek IV: The Voyage Home. The one thing Star Trek V was missing in comparison to J.J. Abrams’ Star Trek films was “the ride,” he said. In addition to his new documentary, he said he’s still working with Priceline, a video project called “Brown Bag Wine Tasting”, and two other projects that he can’t yet announce. 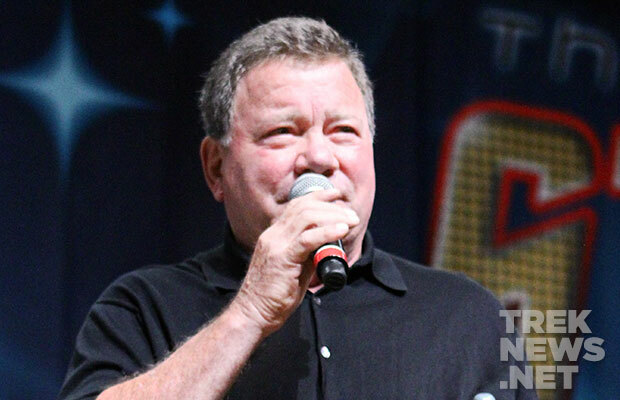 “I always tried to play Kirk with a sense of awe and wonder” Shatner told the crowd of his iconic character. 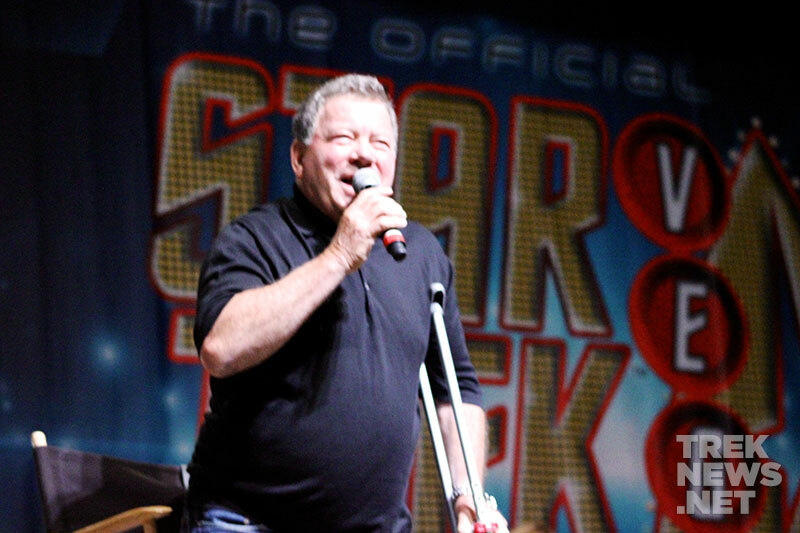 Following a brief waive, which caused an eruption of cheers from the massive audience, Shatner used his crutch to head backstage. 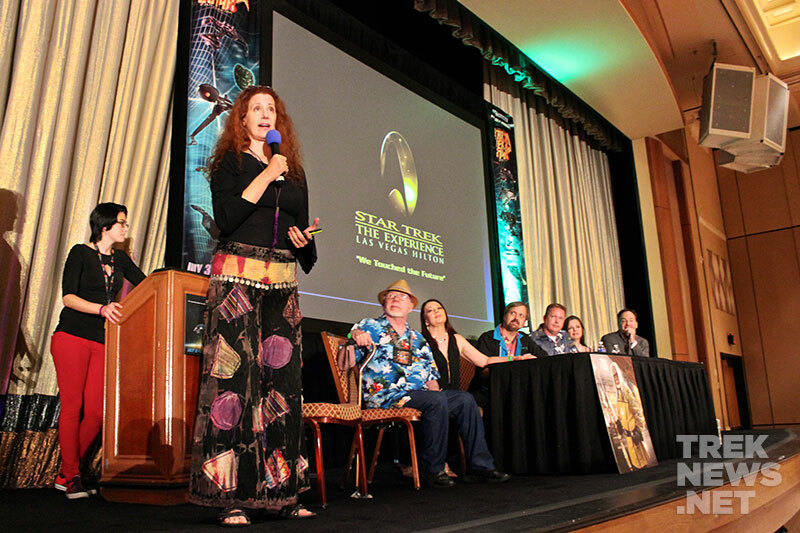 The final panel of the convention saw Geek Magazine’s Kayla Iacovino moderate a panel discussing Star Trek: The Experience entitled “We Touched the Future”. Larry Nemecek along with former employees April Hebert, Vernon Wilmer, Michael Hartnett, and Nicole Padburg took a retrospective look at the attraction which closed in 2008–including personal photographs and stories. “I had no idea of the impact it would have,” Hebert said of her time as a Starfleet Officer, Commander Tahryn and Professor T’pril at The Experience. “I believe that place had a soul. It was an entity” she added. Vernon Wilmer, who produces the documentary series Star Trek: My Experience, dedicated his speaking time to show a video tribute to Thomas Deishley. Deishley, who played the Klingon General Motog at the Experience, was tragically killed at his home, late last year. Wilmer’s dedication to Deishley has been embedded below. “It was the most wonderful experience of my life” Hartnett told the standing-room audience in the DeForest Kelley Theater. In recent years, the convention has ended in the late afternoon following a final auction of autographed signage and banners. 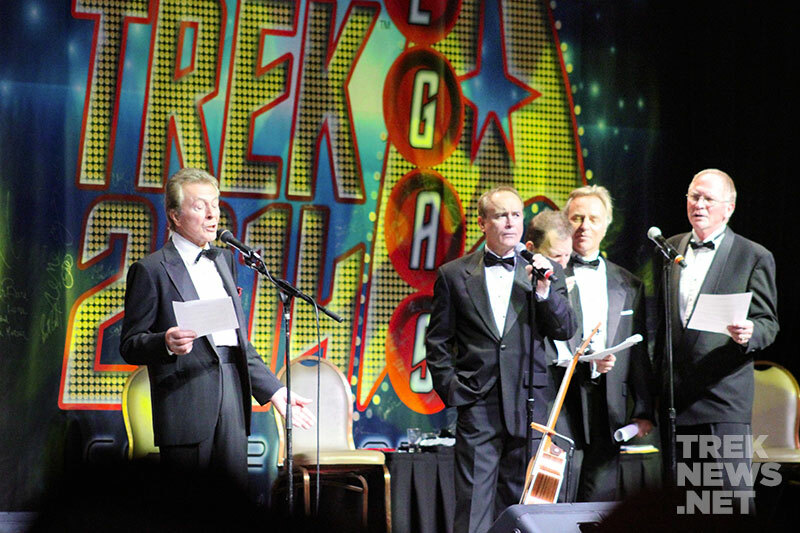 This year, fans who stayed on Sunday night were treated to a special musical performance by the “Star Trek Rat Pack”. The band is an evolving lineup of former Star Trek actors, who usually perform as the “Enterprise Blues Band,” playing parody versions of classic songs. 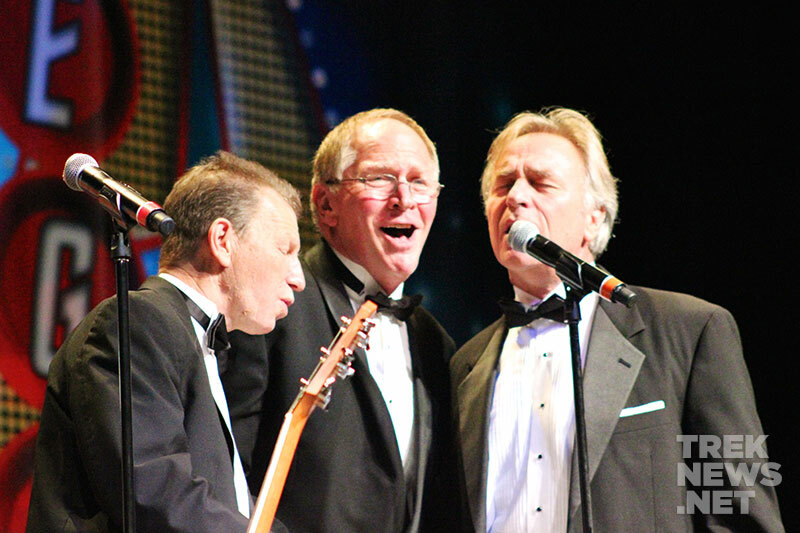 The “Rat Pack” lineup included Casey Biggs, Vaughn Armstrong, Jeffrey Comb, Max Grodenchik, and special guest James Darren. 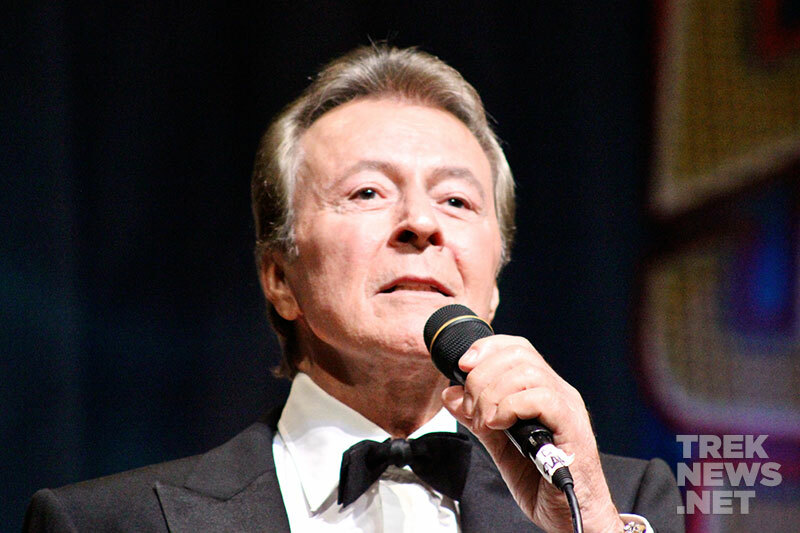 Darren, who played Las Vegas lounge singer Vic Fontaine on Star Trek: Deep Space Nine, belted out classic Frank Sinatra hits, including “The Best Is Yet to Come”, “Come Fly With Me” and “The Way You Look Tonight”. Looking up at the stage, I couldn’t help but imagine myself sitting in the DS9 Halosuite with Odo, Kira and Sisko. It was a great way to cap off the four-day event. As we previously mentioned in our Thursday report, Creation really raised their game with this year’s event. High-definition screens on each side of the main stage, the house band Five Year Mission playing between panels, functional Enterprise doors for the guests to walk through on the stage, plus free photo op areas for fans–including a full-size “Guardian of Forever” prop and a TOS-style transporter platform were all welcome additions. 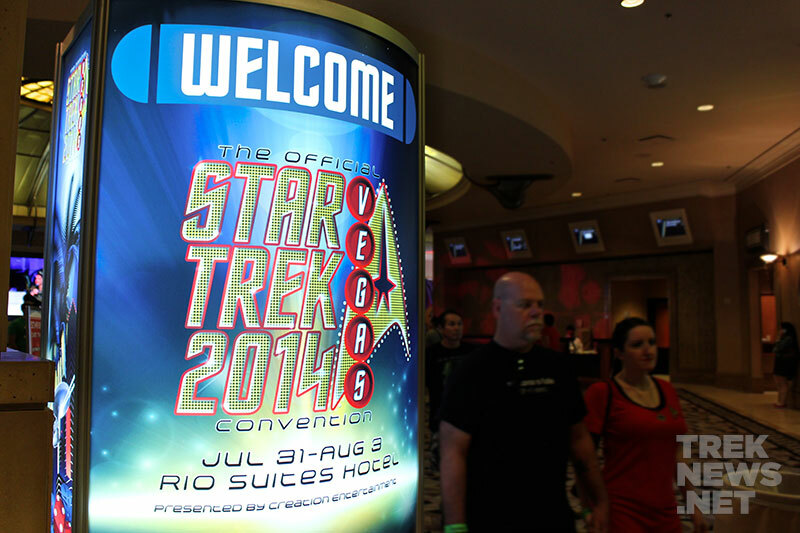 Next year, the Official Star Trek Convention in Las Vegas will return to the Rio Suites Hotel and Casino and will take place August 6-9, 2015. Creation announced initial plans for the 2016 convention, which will celebrate the 50th anniversary of the Star Trek franchise. The event will expand to five days and should see multiple upgrades, including new features, additional guests and more attractions.